"Charles E. Walton was said to be one of Wakefield's most prominent citizens, active throughout his life in civic, church, fraternal and military organizations. He was a native of Wakefield (South Reading) and both his father and mother's families, the Waltons and the Eatons, were prominent in the town and the shoe making industry. Charles was elected to the Board of Auditors in 1892 and served as a member of the Board of Selectmen from 1894 to 1898. He was appointed Tax Collector in 1897, and was elected annually until his resignation in 1935. 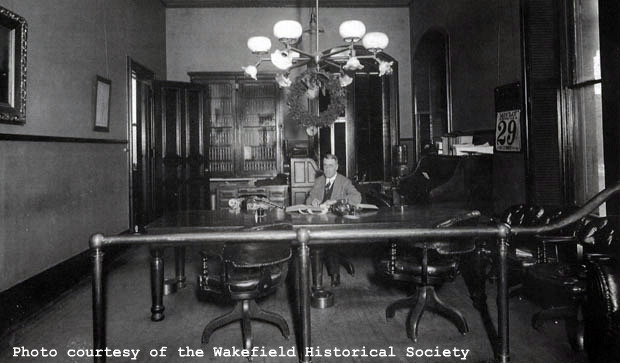 He became the treasurer of the Wakefield Co-operative Bank in 1907 and conducted both town and bank business in the Town Hall for more than 28 years. He remained as the bank's treasurer until 1941 when he became Vice President and Clerk, and worked at the bank every day until his death in 1945 at the age of 85. In addition to his town activities, Charles was a corporator of the Wakefield Savings Bank, beginning in 1897, and was the longest serving corporator at the time of his death. He was treasurer and clerk of the Lakeside Cemetery Corporation, chairman of the Public Safety Committee during World War I, a lieutenant in the Richardson Light Guard, a Spanish War veteran, and served as the military instructor for the Wakefield High School battalion from 1900 to 1902. He was a member of the Wakefield Rotary Club and had attended the weekly meeting the day before he died." - Text from calendar by Jayne M. D'Donofrio. “Charles E. Walton, Selectmen's office, December 1913,” NOBLE Digital Heritage, accessed April 20, 2019, https://digitalheritage.noblenet.org/noble/items/show/6896.